Our product line specifically addresses the wide spread problem involving flush mount windows and pre-cast concrete within architectural systems. The flush mount design often results in minerals leaching from the pre-cast stone onto the glass. While supplying products to restore each architectural surface within the system, we also supply protective treatments which work together to protect the entire envelope, effectively mitigating the mineral leaching problem. After the restoration we always recommend cleaning the newly restored surfaces with deionized water only and if necessary products like Scumfrees Professional Window Cleaning Detergent which cleans the surface without causing additional stains. 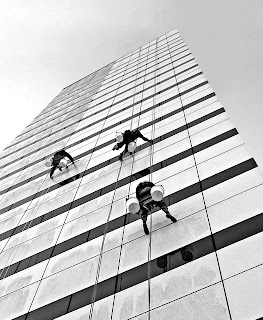 The industry standard for window cleaning is with the use of dish washing detergents and our research has found this to create additional stains on building surfaces. We offer consulting services to service companies, as well as property owners, managers and developers. While the product line is effective for use in both the residential and commercial building market, the products are primarily designed to withstand the extreme conditions to which high rise architectural materials are subjected. Architectural surfaces exposed to these gruelling conditions see above average exposure to a variety of environmental factors, resulting in the rapid formation of dirty looking stains. These stains form often despite regular maintenance services. This is particularly evident in the case of glass stains. Our glass restoration products and protective treatments produce unparalleled results when compared to similar industry products. The Glass ReSurfacer System is a complete solution for the removal of hard water stains, mineral deposits, and glass corrosion. 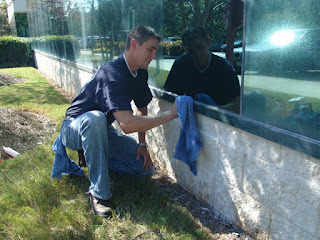 After the glass stain removal process, we supply glass protective treatment options to meet a variety of needs. The Glass ReSurfacer Final Polish produces the fastest and finest glass restoration finish in the world, Guaranteed. The Glass Defender Series can protect your architectural glass surfaces for 5 to 20 years. Scumfrees Professional Window Cleaning Concentrate will clean your windows without harming the Glass Defender Series and without causing stains like most other window cleaning additives. 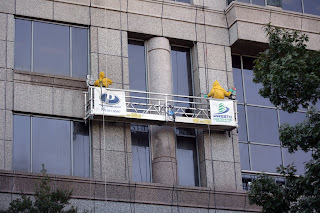 Presto is a unique building restoration products company that is highly experienced in not only the chemical aspects of the cleaning and restoration industry, but abrasives as well. 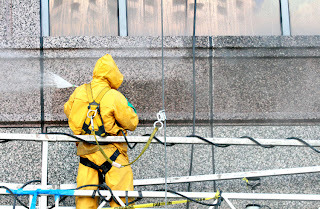 Abrasive cleaning products produce superior results on highly polished surfaces like glass, metal and polished stone. 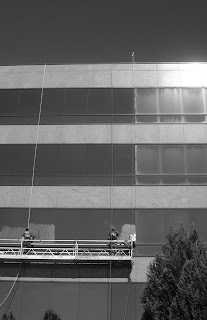 Anodized aluminum window frames and composite aluminum panels are the most common types of architectural metal that can be effectively restored with our metal restoration product line. Our building restoration products utilize abrasive technologies which allow us to use more environmentally friendly ingredients and produce better results than industry standard building restoration product options. Our stone cleaners and stone sealers effectively restore the appearance of a variety of stone materials including pre-cast stone, natural stone, and concrete. After the restoration process, our stone sealers are designed to protect the stone materials and help prevent water from penetrating the material. Sealant products within our line produce a variety of end results including: enhanced stone surfaces, graffiti protective capabilities, and invisible stone protection. Leach Stop Mineral Leaching Mitigation Treatment will protect architectural surfaces such as concrete, precast, cast stone, GFRC, & Natural Stones from Leaching onto glass and metal frames. As well, it will prevent water penetration for over 10 years. Presto has developed a network of qualified applicators around the world who are experienced in the building restoration and maintenance industry. Property owners interested in the use of our products for restoration and protection of specific investments, should contact us, or send us your information. Presto Restoration Products was created by a group of individuals who have been in the commercial building restoration industry for over 2 decades, performing the services for which we design products. This gives us an in depth understanding of the best products and methods for building restoration & preservation. into yesterday's world, for a better tomorrow. in the building restoration and maintenance industry.